Like many children, Sophie loves bubbles. 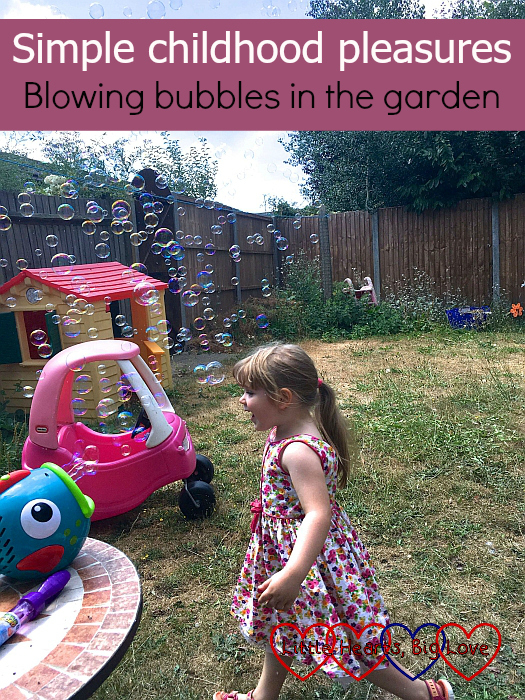 Getting out in the garden and making bubbles is such a simple thing to do, but is so much fun. We’ve tried out a few different bubble machines and have found that the Early Learning Centre bubble fish is the best so far. Using good quality bubble mixture also makes a difference. Again we’ve tried a few different types and our favourite is the Early Learning Centre’s bubble mix. We always get plenty of decent size bubbles when using a combination of the two. As well as using the bubble machine, we also made some bubble snakes. This is such a simple and fun activity. You just need a plastic bottle, a sock and a bowl full of bubble solution. Cut the bottom off the bottle, slip the sock over it, dip it in the bowl and blow. Just remember not to breathe in otherwise you’ll end up with a mouthful of bubble mix. Sophie managed to blow a few decent sized bubble snakes before she forgot about not breathing in. She wasn’t too keen on trying again after that! I loved watching her spinning around and running through the bubbles from the bubble machine. We tried making our own giant bubble wand with pipe cleaners and putting bubble mix in a washing up bowl but didn’t have much success with this. 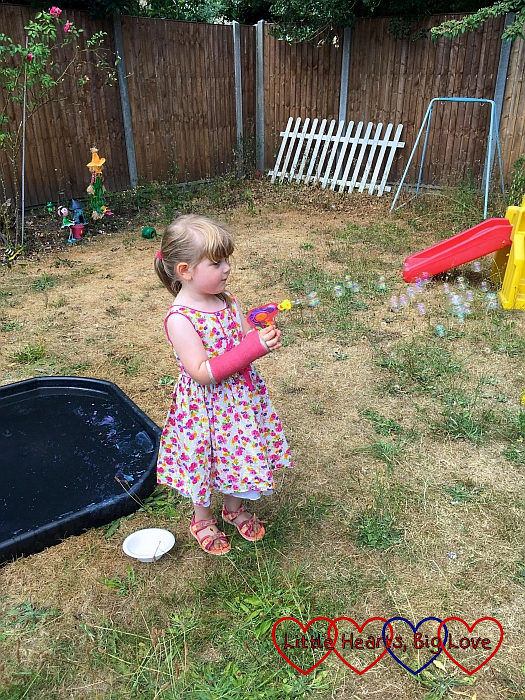 Sophie soon gave up in favour of using her big bubble wand instead. She also has a bubble gun which she dips in bubble mix and then pulls the trigger to make bubbles. This is good for creating bigger bubbles. 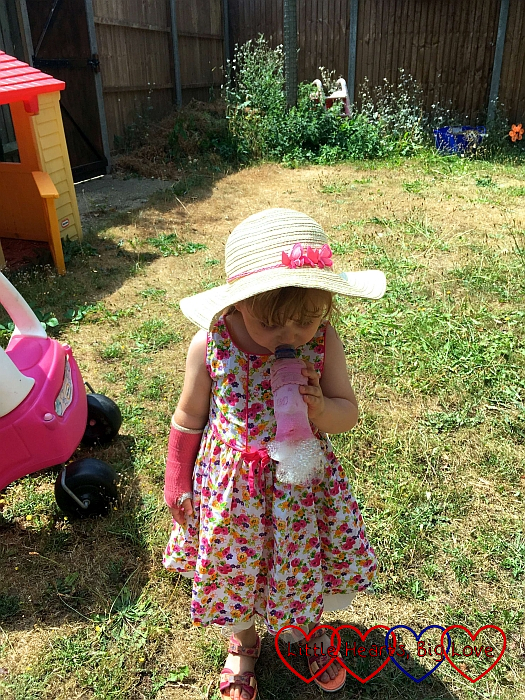 Sophie was determined to try and make a bubble as big as she was so she could step inside and float around the garden. She did make some nice big bubbles but despite her best efforts, they weren’t quite as big as she would have liked! Watching Sophie play with bubbles in the garden is quite bittersweet for me. Jessica always loved playing with bubbles too. 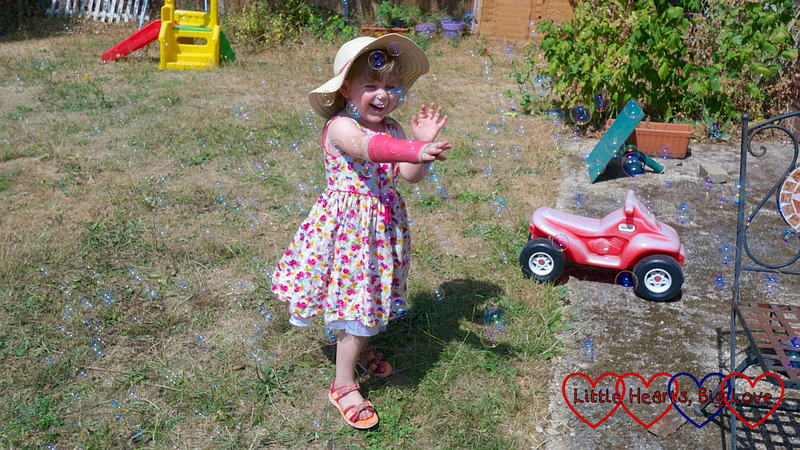 The bubble machine that we now use is one that we bought to use at Jessica’s burial. It was Sophie’s job that day to set the bubble machine going as we said our goodbyes to her big sister. I always think of Jessica now whenever I see bubbles. Most of the time it makes me smile to think of the happy memories, but there is always that sense of sadness too. Thankfully for Sophie, bubbles just seem to be something that bring her joy. 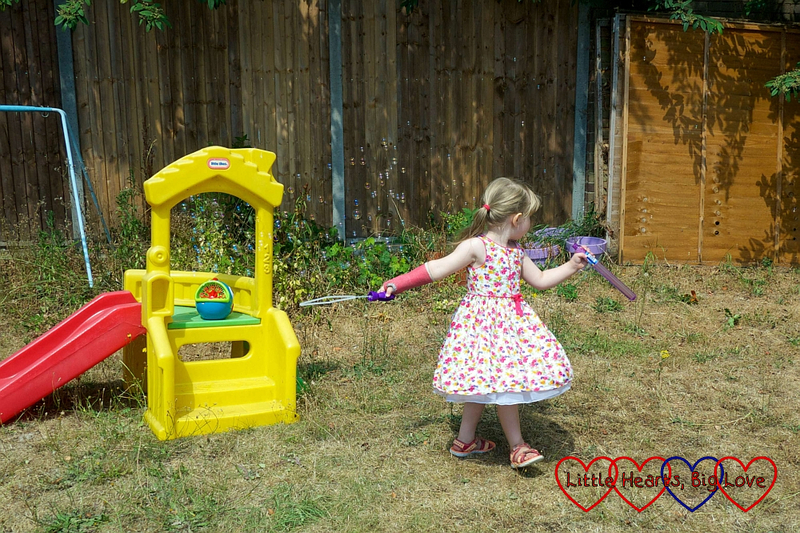 It is lovely to see how something so simple can bring so much happiness to a child. I’m glad the bubbles still bring Sophie joy, I bet she associates them with happy times with Jessica rather than sad times without her. I like the bubble snake idea, never heard of that one before. They’re very much associated with happy times for Sophie which is a good thing. Bubble snakes are fun as long as you don’t forget that you mustn’t breathe in. Sophie always gets put off trying again if she does that! Oh wow we love bubbles – who doesn’t right?! But we have never made a bubble snack and didn’t even know how to before this post.